For small and mid-sized engineering firms, achieving profitable, sustainable organic growth in today’s highly competitive market is a challenge. With finite resources to devote to business development, consulting firms must be selective in pursuing projects if they are to build portfolios that support their particular cultures and goals. 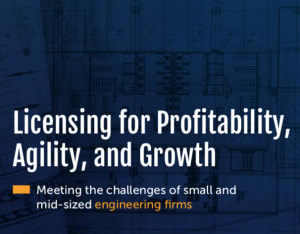 To pursue the best mix of opportunities and expand into new geographies and markets, engineering firms must manage licensing at the individual and firm levels effectively and efficiently. But how does one manage licensing proactively to support greater profitability? This white paper is here to give your firm a roadmap that will guide you toward sustainable license compliance. What the engineering licensing triangle is, and why it's important. The difference between certificates of authority and certificates of authorization. How to best maintain licenses and registrations. Complete the form on this page to download your free white paper. Your download is sponsored by Harbor Compliance.